Billed as the 'Music Event of the Year' at the Dreamworks Website there is certainly a lot to live up to. Fortunately, this is very much that; a stunning, epic musical journey, containing some wonderful Hans Zimmer score and flavourful and emotive Stephen Schwartz songs. The actual music contained in the film runs from tracks 2 to 15, with track 1 being the end credits song. The final three songs aren't by Schwartz, with track 14 being a pop adaptation of one of the in-movie songs; Confused?! You will be, especially as there are two other CDs of music from the film, inspired-by cash-ins as well. The song that opens the film functions in a way much like Circle of Life opened The Lion KingThe Lion King or Bells of Notre Dame opening The Hunchback of Notre Dame and contains certain amounts of scene setting and background story as well as setting the tone for the film and music. It is certainly one the highlights of the album and mixes epic choral sections with introspective moments as Moses' Mother puts her son into a raft and lets him down the river to save his life. The Reprimand begins slowly, but builds into some almost dance-like music (with a broad ethnic feeling). Following Tzipporah is rather quiet to start with but builds quickly to segue straight into the next song. All I Ever Wanted is sung by Moses and comprises of one of my other favourite songs on the score. It is one of the emotional highlights of the film as Moses starts to question his heritage. It's just a shame that his section only features for around two minutes, it ends too soon and invites repeated playing. The reprise sung by the Queen is more gentle and less anguished than Moses's rendition, but provides a nice coda to the track. Goodbye Brother is an exciting cue as Moses kills one of the guards while trying to protect one his people. He then runs out into the desert leaving his brother. Again, the emotional weight of this moment in the film is mirrored by Zimmer's appropriately heartfelt and dramatic music. As Moses runs into the desert, the music turns to become more action packed, but then becomes sombre with extra weight being given by Ofra Haza's beautiful female vocal. The middle of the film deals with Moses growing in a family that he stumbles on in the desert. The emotional weight of the songs isn't as great as is demonstrated in Through Heaven's Eyes which is spoiled by Lai-Lai-Lai singing the middle as well as some slightly naff ethnic dancing music. Brian Stokes Mitchell provides all the best moments. Compared to the other songs, it is rather unmemorable, and actually works better in the film than on CD, since the dance music is accompanied by a celebration that gives it some much needed context. The Burning Bush is one of the highlights of the orchestral score and introduces Zimmer's descending God motif, which is filled with appropriate amounts of awe and wonder and the cue is basically a theme and variation as God first speaks to Moses and is quite beautiful. After his encounter with God, Moses returns home to confront Pharaoh and make him release the Hebrews. Playing with the Big Boys is given a suitably creepy performance by Messrs Steve Martin and Martin Short. Their singing is quite adequate to the needs of the song, but it just doesn't quite pull off what is intended as the big villain number. The backing orchestral music at times recalls Night of the Bald Mountain which is quite an appropriately creepy piece of music to suggest. However, the next offering is the third of my favourite songs and possibly comes out as my favourite. The Plagues is a truly incredible song which returns to the high drama and emotion of the first section. It is expertly sung by Ralph Fiennes as Ramses (who has now succeeded his Father as Pharaoh), Amick Byram (Moses) and a chanting choir. On it's own, this song has great power and matches well the awesome forces of the plagues that are sent down by God on the Egyptians. Although entitled as The Plagues, the actual lyrics play Moses off against Ramses to great effect, with the choir intoning the nature of the plagues as they are brought to life by the animators. Death of the First Born appears just after the most upsetting moment in the film where the Angel of Death is sent to kill all the first born of Egypt. When this has passed a great wailing appears in the city and Zimmer's' heartfelt 'cello solo succinctly captures the distress of the families who have lost. I have noticed that many animated musicals don't introduce songs late into the story, so it is refreshing to see the directors of Prince of Egypt to do just that. When You Believe is initially sung by Michelle Pfeiffer (clearly her talent for singing isn't tapped which is a shame as it's very good indeed) and Sally Dworsky. There is a short interlude of celebratory dance music that rather spoils the song (coupled with the shots of smiling children rather spoils the mature nature of the rest of the film and score). The chorus joins in toward the end and with a small section of duet as the choir fade out, the music then leads into the Parting of the Red Sea. This makes for a stunning and rousing ending to the score which contains much epic and very heavenly choral music along with ascending horn figures countered against the descending God theme. There is a moment just before the end when a piece of gripping Zimmer action music appears, which appears to make no sense, but is for the moment when the escape is momentarily threatened by Ramses' army, but all is resolved when the sea returns to normal and drowns Pharaoh's soldiers. The pop version of When You Believe is given a suitable wobbling performance by Mariah Carey and Whitney Houston but doesn't really match the original and the overly emotional singing is somewhat distracting. The less said about the other songs, the better, which are fairly inconsequential when compared to the rest of the score and should be skipped. Still, there is plenty of score, and since the songs are so brilliantly bound up in the narrative and musical design that any complaints about the songs to score ratio become somewhat redundant. The approach of an epic set in a foreign land bears comparison with Mulan, but overall, this comes across much better on the whole, the fact that the music and songs mix so much better helps immeasurably and I find that Zimmer's score is more accessible than Goldsmith's, the songs are considerably better and certainly on a par with the best of Menken. If Dreamworks doesn't make a mint from either the score or the film (which is absolutely amazing) I will be very surprised and rather disappointed. A must buy, probably the finest animated musical score since The Hunchback of Notre Dame and only marred my a couple of extraneous pop songs around the edge. 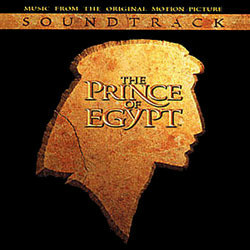 The Prince of Egypt has been given a strange treatment by Dreamworks Records. There are three different albums available. One with country songs, another with "Music inspired by..." and finally this, the actual soundtrack. You may wonder why they didn't release a score album, instead of some crappy inspirations... Anyway, there's around 30-40 minutes of Zimmer's score on this CD (50-60 minutes if you count the songs, which were arranged by Zimmer), plus songs by Stephen Schwartz and a couple of easily skipped pop songs. Zimmer's music is a true epic score, and he sets the tone immediately in the first orchestral track, (although there are some orchestral music in "Deliver Us") "The Reprimand", with an arabian sounding, slow theme, played first by woodwinds, later joined by brass and strings. This is a theme Zimmer will use throughout the score, in many different shapes. Zimmer then adds some more ancient Egyptian sounding music, played on ethnic flutes and other arabian intruments, mixed with the sound of the traditional symphonic orchestra. Very effective, and very good. "Following Tzipporah" is a short slow cue, with synts, orchestra and percussion. In "Goodbye Brother" we get some traditional Zimmer action music, with heavy percussion, brass and choir, but with an egyptian twist. There's also some beautiful cello solos, backed up by a soft choir, plus some vocals by Ofra Haza, a la Titanic, but with an entirely different mood, and sound. "The Burning Bush" is a track with choir and orchestra, that builds to a wonderful powerful climax. In this cue we hear Zimmer's "God motif" for the first time - a descending and very powerful motif, that's also used in the cue "Red Sea". This may very well be the best cue Zimmer has ever written. In "Cry" Zimmer once again makes use of Ofra Haza's voice. It's a very sad, but wonderful track. "Rally", only 42 seconds long, is in the same style, and takes us directly into the song "The Plagues" (Many of the songs and the score tracks work like this - tied together.) which has some very effective choir music. "Death of the First Born" continues this dark, sad, direction the music has taken, with a cello solo, filled with sorrow. The last Zimmer cue, "Red Sea", is a very dramatic track, with Zimmer's poweful orchestral sound, along with choir, and solo trumpet. Plus a dash of percussive rythms. What makes this album so good is that almost everything on it is great. Most of the songs by Stephen Schwartz are wonderful, except for "Playing With the Boys", performed by Steve Martin and Martin Short. This has nothing to do with the both gentlemen's performance. It's just a boring song, and I think that it seemed out of place in the film, too. Most of them are traditional musical songs, like for instance "All I Ever Wanted" (a great, Lloyd Webber sounding, song, performed by Amick Byram and Linda Dee Shayne, with terrific lush orchestral backup), "Through Heaven's Eyes" (performed by Brian Stokes Mitchell, starting very powerful, and dramatic, before a children's choir introduces a lively, folkish, melody), "The Plague" (a very dark, mystical beginning, with chanting voices and huge orchestral support). And then there's "When You Believe", a very beautiful song, with a simple, but great melody, performed by Michelle Pfeiffer and Sally Dworksy, both with rather fragile, but splendid, voices. The song ends magnificent with a majestic choir. "Deliver Us" starts out with a very powerful orchestra and choir of slaves, asking their God to help them, before a version of "River Lullaby" takes over. The songs are all arranged by Hans Zimmer, to fuse with his score. This is of course terrific - that the songs and the score are in the same style. I really think we have a possible Oscar winner here. Now, let us just pray that there will be a special score album released. There are som much splendid music in the film, not featured on the soundtrack.